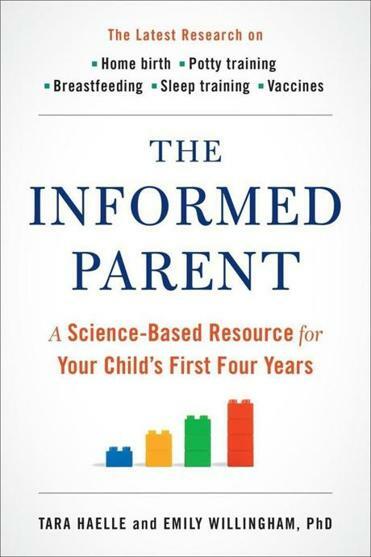 Today’s parents are inundated with information about everything from genetic testing to vaccines to thumb sucking. But sometimes this wealth of information can feel, paradoxically, like not enough information. At least that’s how Tara Haelle felt. In short sections running chronologically from pregnancy through toddlerhood, Haelle and Willingham review current peer-reviewed data on such questions as how to manage morning sickness, when to stop breast-feeding, and how much screen time to allow preschoolers. In some cases they reveal decisions they made personally. For example, Haelle took antidepressants for postpartum depression and Willingham chose nonpharmacologic treatment. Willingham fed her first baby only organic foods while Haelle bought organic foods mostly when on sale. By highlighting instances when they made different choices, Haelle and Willingham underscore that there may be more than one answer to a child-rearing question, even when scientific information is available. “We’re hoping to demonstrate that you make these choices . . . based on the data and your interaction with that information based on your own family, . . . personal experience, and your personal needs,” Willingham said.